Armor is an important part of your strategy in The Witcher 3. You need to choose a set that complements your playing style, which means compromising. Do you go for better defense, adrenaline point generation or stamina regeneration? Before you start thinking about that, you need to find good armor or diagrams for crafting it. In this guide, we’re going to show you sets of the best armor in The Witcher 3, their locations and stats. Blood and Wine expansion introduces new armor sets Tesham Mutna Armor (heavy armor set for level 39), Manticore Armor (medium set) and a new level – Grandmaster for Bear Ursine, Feline Cat, Wolf and Griffin Witcher Armor. Grandmaster Feline Cat Armor is the only hooded armor in the game! Take a look at our guide for new Blood and Wine armor sets. Viper Armor Set is a new Witcher gear set from the Hearts of Stone expansion. It’s a level 39 medium set which has a great armor rating and provides near immunity to poison. The Ofieri set is a stylish armor from the HoS DLC. It is a level 38 light armor set which improves Sign intensity a lot. You can get it during one of the side quests in the expansion. The New Moon Armor certainly isn’t the best in terms of stats, but it is one of the better looking ones. You can use it at level 34, and you don’t even need to craft the pieces. 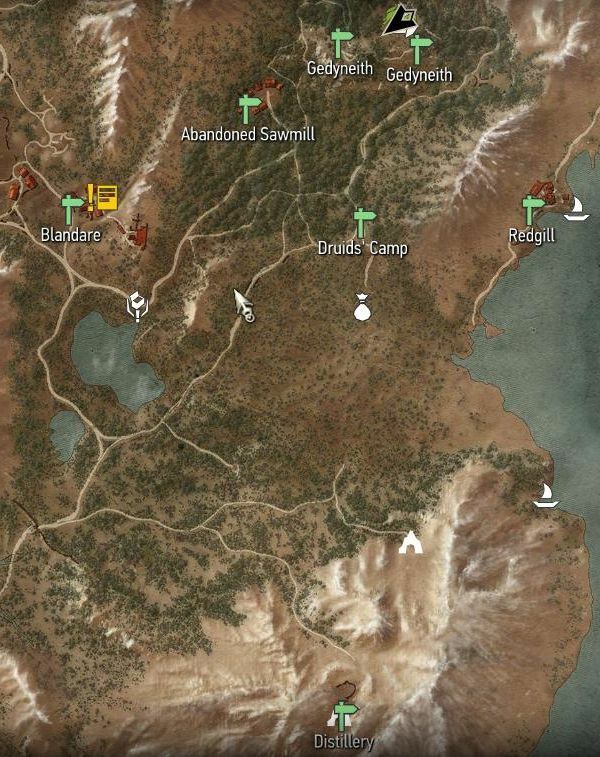 They can be found (in various qualities) in certain locations in the new part of the map. UPDATE: Patch 1.07 changed the level requirements for many sets. We’ve updated the guide to reflect this, so if you find armor whose requirements don’t match the ones written here, you’re probably playing an older version of the game. Skellige Undvik Armor Set is an outfit added to the game in a free DLC pack. You have to be level 41 to use it, but it provides unprecedented amounts of protection. It’s a heavy set and comes with matching horse armor. The Wolf School Gear diagrams can be found scattered around Kaer Morhen. You’ll need to be level 14 to use them. The armor is medium weight – it provides increased attack power and sign intensity, while the swords have a decen damage output. This set is convenient for Signs builds, or hybrids that rely on swords and signs equally. The Enhanced Wolf Gear is an upgrade for the Wolf School Gear – expect more sign intensity, better attack power, and a moderate increase in protection. You’ll have to be level 21 in order to equip it. The Superior Wolven Gear is the third tier of upgrade for the Wolf School armor. Even more attack power and sign intensity than the enhanced version, with better protection. You’ll have to be level 29 if you want to use it. The Mastercrafted Wolf Gear is the final upgrade for the Wolf School armor. It offers great bonuses to attack power and sign intensity, a moderate amount of protection and greatly increased critical hit chance. You need to be level 34 in order to wear it. The Griffin Armor Set diagrams can be found in Velen, in Dragonslayer’s Grotto, north of Crookback Bog. It’s a medium armor set that requires level 11 to use, and provides increased sign intensity. It’s a great choice for anyone who opted for a Sign build. Enhanced Griffin Gear is an upgraded version of the basic Griffin Set. This is the second out of four (Basic, Enhanced, Superior and Mastercrafted) upgrade levels available for Griffin Sword and Armor Set. Diagrams for enhanced Griffin Set versions are found all over Velen (No Man’s Land). This is a level 18 weapon and armor upgrade of the basic Griffin School Gear Set. Superior Griffin Gear is the level 3 upgrade for the Griffin School Set. Before you can upgrade your set to superior, you need to boost it to Enchanced Griffin first. In order to wear this armor your character must be level 26. Mastercrafted Griffin Gear will give you an amazing increase in elemental damage resistance and sign intensity. Since it’s so good, you’ll need a level 34 character for the armor, as well as the swords. The Cat Armor Set diagrams can be found in a cave underneath Novigrad, and are pretty tricky to get. The set is light-weight, and requires a level 17 character (the crossbow requires level 29). It’s biggest strengths are the increased attack power and stamina regeneration – it’s meant for agile swordsmen. Enhanced Feline Gear is level 2 update of the basic Feline / Cat School Gear. This set is best for mid-level players because both the swords and the armor require level 23 to use. Six set diagrams are scattered all over Novigrad and Velen. In order to apply Superior Feline Cat Gear diagrams, you’ll first need the Enhanced Cat Gear. This set is suited for players at level 29. Superior Feline diagrams are scattered around Velen (No Man’s Land). There are powerful enemies (level 18-27) guarding some of these diagrams. Mastercrafted Cat Gear is one of the best light armor sets in the game – it massively improves stamina regeneration, adrenaline point generation and provides an immense increase in attack power. Level 34 is required to wear the armor and wield the swords. The Bear Armor Set diagrams can be found in Skellige, on An Skellig, just north of Urialla Harbor. It’s a heavy set which provides amazing protection, but tones down stamina regeneration. As such, it could be of great use to either dedicated alchemists or sturdy tanks. You need to be level 20 to wear it (except for the crossbow, which is level 29). Enhanced Bear Gear is the second level of upgrade for Bear School Gear armor and weapons. There are six diagrams you need to find in order to upgrade the whole set. You need to be level 25 to wear it. Superior Bear Gear is the third tier upgrade for Bear School Gear. In order to get it, you must first have Enhanced Bear Gear. You need to be level 30 to wear it. Mastercrafted Bear Ursine Gear is the best version of the Bear Gear set – it provides amazing amounts of armor, much improved adrenaline point generation, while crippling your stamina regeneration. In order to use it, you’ll need to be at least level 34. Nilfguardian Guardsman Armor is a late-game heavy armor set (lvl 28/31) that provides great protection from all kinds of physical damage, but also decreases stamina regeneration. You can either craft or buy the pieces. There are a lot of potions in Witcher III, so I figured it’d be helpful to have a quick rundown of them. Any potion can be active while another potion is active, but they all increase toxicity. Too much toxicity and you start to die, although some skills trigger at various levels of toxicity. You can see your toxicity under your health bar (it’s the green bar). To learn how to craft potions and restock them, visit our Alchemy guide. Most potions come in regular, enhanced, and superior forms. Superior potions usually bring along another effect. All of the formulas should be located on a herb dealer, herbalist, or alchemist. Some formulas are from random herbalists, while others you’ll find on Skellige only. There is a quest required to unlock a lot of the formulea, which I’ll go into in a second, but there is also a lot of vendors in the area who sell say decoctions (at the Druid’s Camp nearby). Favor 1: Obtain some pimpernel. Step one is to locate the plant, at which point you’ll meet a tracker who then whines about people going crazy from it. Follow the trails a short distance until you meet a Succubus and Ramund. Make a choice – fight the Succubus (she’s powerful) or side with her. Neither has consquence to note, but if you side with her she’ll take you to her liar and give you the pimpernel (if you fight her you have a great chance at a Succubus mutagen). Favor 2: Go to the distellary, it’s near the pimpernel spot (and has a fast travel sign too! ), defeat the cyclops, then climb the nearby ladder to loot some mash. 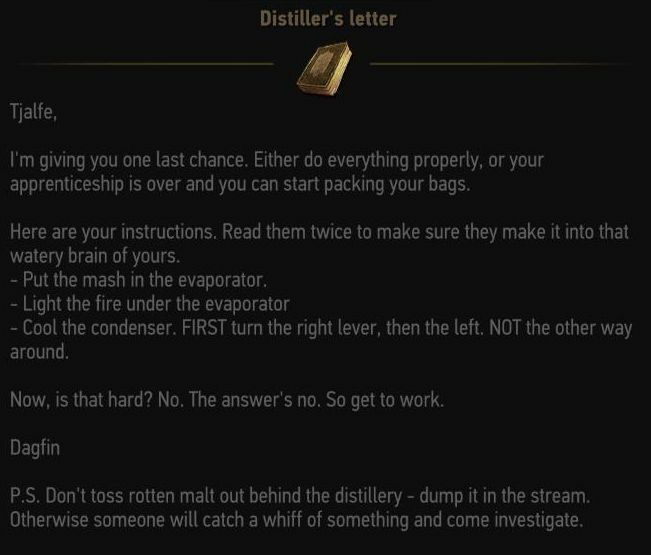 Then go into the house and read the instructions on how to brew liquor. First, put the mash into the big metal machine thing (you’ll need to move the mash from your inventory to the machine, a pop-up will appear after you’ve read the instructions). Then light the flame under it. Then use the right lever, then the left, and then loot the spirit from the barrel. Favor 3: Go to Blandare. This one is quick and you can fast travel either to the Druid’s Camp and walk or fast travel to the town if you’ve been there. Once there, talk to Fritjof and folllow him to the altar, where you’ll need to kill some foglets. Afterward you’re done. Once you return to Gremist, he’ll give you a ton of materials and then sell a huge amount of formula you wouldn’t have access to otherwise. Black Blood: Does damage to any vampire / necrophage that hits Geralt. Blizzard: Slows down time after Geralt kills anything. Useful in large brawls (like toward the end of the game) but useless in 1v1 fights. Cat: Allows you to see in the dark. Enhanced Cat lasts longer and makes you immune to hyponsis. Meditate or drink the honey to remove. Full Moon: Increases your maximum health – great to use before a boss fight. Golden Oriole: Removes any poisons and makes you immune to poisons. Poisons never bothered me so I never found a use for it. Superior version allows poisons to heal you. Killer Whale: Doubles breath underwater and makes it easier to see. Maribor Forest: Gain adrenaline points faster. Another potion that’s great to use before a boss fight. Petri’s Philter: Increases sign intensity, superior version forces a sign to apply its effect. Swallow: Heals you, pauses in combat unless you have the superior version. Tawny Owl: Increases stamina regeneration. Superior version lasts all night long (meditate before a fight to set it to night for best use). White Honey: Removes all toxicity and cancels potions. Great for removing cat without having to meditate. White Raffard’s Decoction: Doesn’t require a mutagen, restores health to full and grants immunity to damage for a short bit (the superior version anyway). These require specific mutagens and the formula (formulea) and are much stronger, but with way higher toxicity (normal potions are like 20%, these are 80% no matter the potion). They also last 30 minutes. Most of these formulea are a bit harder to find than the potions, but a vast majority of them are still sold by alchemist throughout the world or often nearby certain enemies (like early in the game when you come across your first foglet, there is usually a chest in that hidden area of the cave with the formulea in it). Alghoul: Adrenaline points generate more quickly until you’re hit each fight. Ancient Leshen: Each sign cast increases stamina regen until the end of a fight. Archgriffin: Strong strikes consume all Stamina available and remove 10% of the Vitality from an enemy after normal damage. Basilisk: Adds a random effect at dusk or dawn. Chort: Stagger immunity and knock-downs become staggers. Cockatrice: One additional charge per potion, oil, and bomb. Doppler: Critical hit damage increased from behind. Earth Elemental: Resistance to vitality draining critical effects. Ekhidna: Anything that consumes stamina regenerates your vitality. Ekimmara: Lifesteal (damage done regenerates health). Foglet: Sign intensity increased during cloudy weather. Grave Hag: Each time you kill something it increases vitality regen for that battle. Griffin: Taking damage raises damage resistance. Katakan: Increases critical hit chance. Nekker Warrior: Your mount won’t panic and you do 50% more damage. Nightwraith: Maximum vitality is increased with each foe you kill, until your meditate or fast travel. Noonwraith: Complete immunity to knockdown, hypnosis, stun, and blindness. Succubus: Attack power gros during the fight. Troll: Regenerates vitality during and outside of combat. Werewolf: Running, sprinting, or jumping doesn’t use stamina out of combat. Wraith: Whenever you take a hit that does more than a third of your health, it automatically casts Quen. Wyvern: You increase attack power with each blow until you take damage or a fight ends. There are two different versions of the mod depending on your play style. Since potions can be upgraded three times, their upgraded lengths are represented by… Standard/Enhanced/Superior. 5 Min./ 7.5 Min./ 10 Min. This version of the mod has 10 minute potion lengths from the very beginning of the game. 10 Min./ 12.5 Min./ 15 Min. You can mix and match these effects by eating and drinking. Available for both the Standard and Enhanced Versions. Increased Potion Toxicity will make spamming potions more difficult. The new toxicity amounts closely resemble the toxicity of the potions in The Witcher 2. ** This mod works with existing saves and can be easily added and removed. P.S. 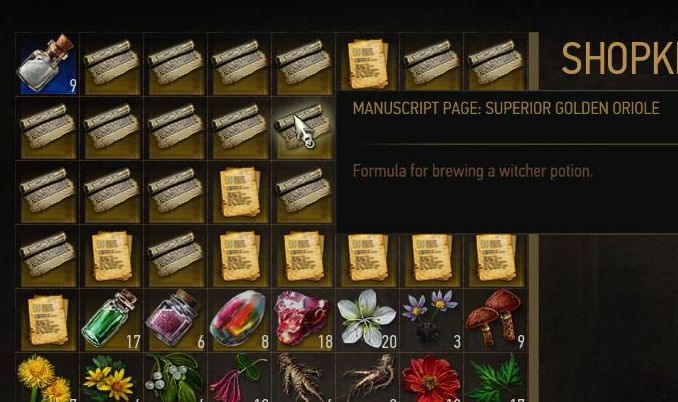 You can also make 127 Crowns on books alone every second day in Novigrad, the bookstore at Hierarch Square. It’s somewhat hidden but easy to find if you know how: If you stand with your front towards the Fast Travelling post at Hierarch Square, then turn left and follow the pathway until you have to either leave the square or turn left once more. Here you take the left turn again, head under the pillars where you’ll find the store. It’s front is in dark brown wood and the door has frames with patted glass. (If you head past the store and continue to the next corner of the square, you’ll find the armor blacksmith, and left-wards to the final corner you find – just before the pathwak out of the square) Vivaldi’s Bank where you can convert any strange cons you may have picked up during your questing. Halfway leftwards back towards the Fast Travel post you’ll find an herbalist with herbs for sale more or less at the middle of the square. These are the only merchants available to PC players though there are plenty more of them, you just can’t engage them in anything other than sying “Hello!” and them replying “Huh?” or something like that – sometimes right after having invited you to come closer and look at their wares). The alchemist at north island of Novigrad buys them at 6c each IIRC. That’s the merchant paying the highest for them that I know of. So the hint here? 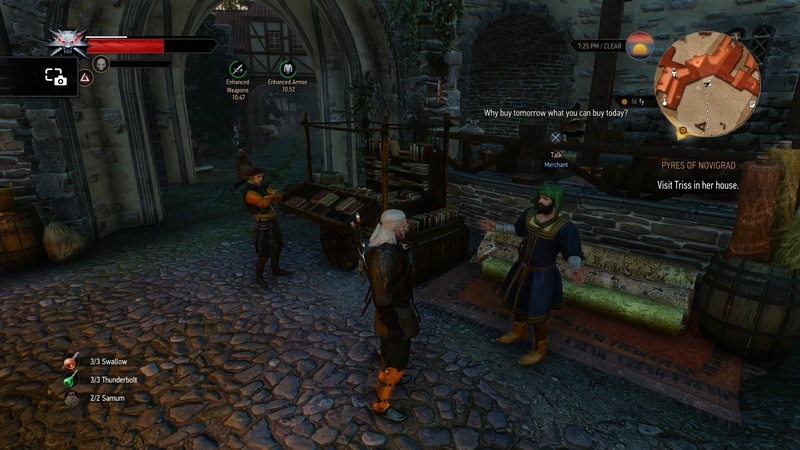 Instead of just selling your books for 1 crown at some random merchant, go to the square in Novigrad and sell them to the book merchant there. He will give the full price for them, and there is some 500-600 in his starting capital. He wont be there all day though, so if he isn’t there, just meditate until he appears. UPDATE So a lot of you asked who the merchant is. Here he is. He is found around 7pm ingame as you can see. But he isn’t there all the time. “Hold Right Shift” – pin module modifier (hold RShift and press M to pin minimap module, for example). “Hold controller Back button” – inventory menu. Hearts of Stone follows Geralt as he gets caught up in a Faustian plot, having to grudgingly help both Gaunter O’Dimm, a mysterious character who has crossed the Witcher’s path before, and Olgeird von Everec, leader of a group of roving bandit with the power of immortality. The Witcher 3: Wild Hunt — Blood and Wine is the second major story/land expansion for the massive RPG adventure The Witcher 3. This 20-hour tale introduces the all-new in-game region of Toussaint, and will take Geralt to a land untainted by war, where an atmosphere of carefree indulgence and knightly ritual masks an ancient, bloody secret. White Orchard Places Of Power – White Orchard is the starting area of the game where you can collect 6 Places of power. Velen Places Of Power. You can collect 6 ability points in Velen. Novigrad Places of Power. There are only 2 Places of Power in this area. Skellige Isles Places Of Power. There are 9 magic stones in Skellige. The following list is all of the missable quests. These quests are missed by progressing too far into the Story. They also vary in length. Some can take 10 minutes, others can take up to 30 minutes to an hour. I will do my best to avoid spoilers, but some quest titles may spoil late game events (they really don’t, but this warning is just incase). Note: I an listing MISSABLE sidequests only, but I will indicate how many sidequests there are total in each area. The number of missable quests are listed within the brackets like this [1 story related]. A vast majority of these are from Act 1, but the guide doesn’t indicate which act these appear in, so I’m leaving that out. No quests can be missed here.